Significantly, Robert Fisk notes US, UK and French intentions to kill citizens who join ISIS, or might. 1 All three countries lecture the world on human rights. They claim to respect the right of anyone, no matter their views, to a fair trial. Germany offers its citizens consular services but US citizens in Raqqa, according to McGurk, will be shot dead in Raqqa. It is the crossing of a moral line. It is a bad idea, morally, to kill people you don’t like, or whose views you don’t like, because you then become the phenomenon you claim to oppose. But it also indicates, again, a world view that rejects science. 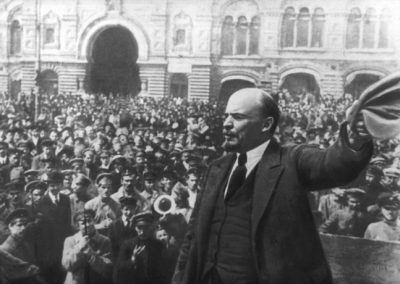 This month is the hundredth anniversary of the October Revolution. It was the first successful revolution against capitalism. It denounced the imperialist blood-bath of WW1, supported by “socialists”, killing 18 million. It also opened new ways of thinking, more realistic ways. Lenin died too soon. He was an innovative thinker. 2 Revolution requires intellectual innovation at every level. Marx’s view was innovatively philosophical, not just political and economic. 3 The philosophical is harder than the political. It can affect how you see yourself, and how you think. Lenin pursued it. He described the mechanics of intellectual innovation. He said knowing the world, including its people, is like a passage through dark waters. There’s risk: moral risk. It cannot be otherwise because we understand the world starting from ourselves. The latter is a well-known truth, but much distorted by post-modernists and constructionists who deny truth altogether. They make the left ineffective. 4 Lenin read Hegel, and scribbled notes in the margins. Hegel got the dialectic wrong but he understood interconnectedness. Lenin’s notes are worth reading. We learn why the moral failure in killing ISIS members, without trial, is not as interesting as the denial of science. A few hundred years ago, European philosophers drew a distinction between facts about how the world is – science – and facts about how it ought to be – ethics. In so doing they undermined ethics. In North American universities, ethicists do not discuss the nature of reality, or how to know it. They leave this for philosophers of science. They think ethics does not require science. Marx thought differently. So did Lenin, and Gramsci, and José Martí. They knew how capitalism and imperialism makes human beings, or some, unknowable. It is not a moral issue. It is a factual issue. Morality, if we believe in it, requires knowing human beings. The Buddha, 2500 years ago, had no truck with the so-called “fact/value distinction”. It wouldn’t have occurred to him. It took European philosophers to come up with the idea. They didn’t need truth. And so it continues. Yet, to know how to live, we have to know people, including “non-persons”, who happen to be the majority. We have to know what is shared, humanly: that which makes us who we are, as human beings. It is partly why Lenin described knowledge as a “passage through dark waters”. If your very own thinking presupposes the “objective world”, you have to lose your attachment to that thinking in order to learn what lies beyond it: the world as it is. Lenin was a realist. So was Marx, and Martí, and the Buddha. Lenin’s passage through dark waters, by itself, opened new ways of thinking. It was so in South America. José Ingenieros, brilliant Argentinean psychiatrist who turned his copious talents to anti-imperialism after the First World War, led a movement for educational reform, across the continent. Like Lenin, he died too soon. Ingenieros saw that the entire educational system had brought South America to the feet of the imperialists. 6 He singled out the hypocrisy of philosophers, engaged in intellectual game-playing when they could have been deepening and broadening understanding of the human condition. That is, Cubans discovered, or rediscovered, the ancient truth that human beings know the world dialectically. How we are plays a role in what we can know. So the moral line-crossing, which, as Fisk notes, has been happening all along, is not most interestingly a moral failing, although it is that. It is part of a disastrous worldview that denies the intricate connection between who we are and what we can know. In an interview in 2005, Fisk said that nothing gives him hope for the Middle East, at least nothing political. But he added that the dignity of ordinary people, speaking out, does give him hope. In The Great War for Civilization he describes such dignity, found in unusually horrible situations. Dehumanizing situations. Fisk’s book gave me hope. It tells things as they are. It exposes the hypocrisy of those who claim to respect human rights, hypocrisy the depth of which is not always easy to detect. It is better to see that hypocrisy than to remain “pathologically upbeat” about a failed (liberal) world view. For this, we need Lenin, among others. But we need him also as a philosopher. And we need Ana Belén Montes. 7 She spoke up about hypocrisy. She is in jail, in the US, under harsh conditions, having hurt no one. Please sign petition here.